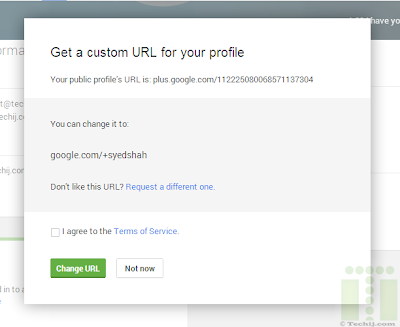 You're now eligible for a unique Google+ custom URL that lets you easily point people to your profile (no more long URLs!). Here's what we've reserved for you: google.com/+syedshah Promote this on: your website, emails or other media. Click on the Get URL button below to get started. Wow! for the moment this felt so great that Google selected my profiles for custom URL's. Because first custom URL's were only available for Google's employees, quite popular brands and personalities. But my less number of connections (1.9K personal profile, and around 250 circles on Techij Google plus page) made me curious because these stats are quite less in comparison to famous people and brands, respectively. But soon when I Googled this, I realized that Google has released this feature for many active users to get a custom URL for their Google plus profiles and company pages. Don’t be confuse with word vanity URL because its an alternative or synonym of Google Custom URL. 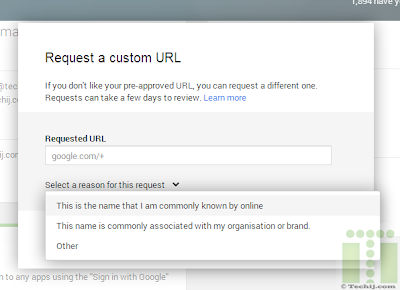 There are few simple steps you need to follow to confirm a preapproved custom profile link from Google. 1. First of all make sign-in to your gmail account and check for an email from Google+ team with subject Get a custom URL for your Google+ profile / page potentially under Social tab, then open email and click on Get URL. 1.1 Alternatively, go to your profile > and click on Get a Custom URL button appears in notification bar OR go to About Tab > click on "claim" link located under Google+ URL to get started. 2. Your profile will open in a new tab with a small popup box. Mark check on terms of service if you are happy with your preapproved custom profile link by Google and then click on change URL to move to the next step. 4. In case you don't like the suggested vanity link you can request a different custom URL for Google profile from same subwindow. 5. Enter your desired link in given field, select a reason why you want to change your preapproved URL. 6. In the next step you must have to verify your mobile phone number by entering a code send which you will get as a text message (SMS), before you can claim a custom URL. Select your country, enter your cellphone number and click on send text. 7. 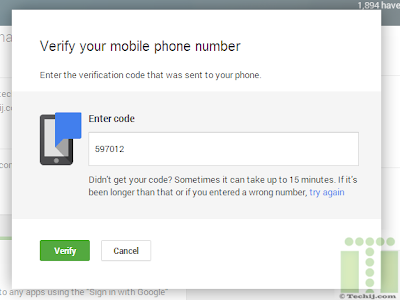 Enter the verification code in a filed that was sent to your phone number and, click on verify button. 8. In next and probably the last step you must need to make it confirm that you surely want to get a new custom Google plus profile link as preapproved by Google. Click on Confirm Choice, and Enjoy! 9. Congratulations, now you have successfully claimed the custom URL for Google plus profile/page. Note: Once you claimed and linked a custom URL to your profile you can't change it again or transfer the URL to someone else. You can edit your URL from About tab > Links section to change its display format. 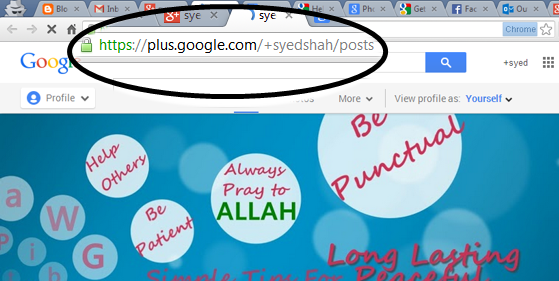 For example, as my Google+ URL ends with +syedshah, so I can use +SyedShah instead. The most obvious advantage of custom URL is that it looks simple, its short, match exactly to your name (by default), more easy to remember, make your brand page more professional, etc. What else you can expect from URL? In case you did not received any email nor seeing any option or notification on your Google+ profile then first make sure that your profile is following the all requirements; has profile photo, atleast 1 month old and circled by atleast 10 peoples. If it is local business or online business then it must be verfied by Google maps or via its official website. Otherwise wait few weeks more because at the moment this feature is expanding gradually throughout the world and you will get inform when Google plus custom URL feature will be available for you. Till then try to make your Google plus profile accordingly to meet the eligibility criteria.